I like to make muffins with a filling. That is where these strawberry oatmeal muffins come in. Instead of just adding strawberries to the batter, I thought it would be better to make a strawberry cream. My daughter calls them muffins with surprises inside. 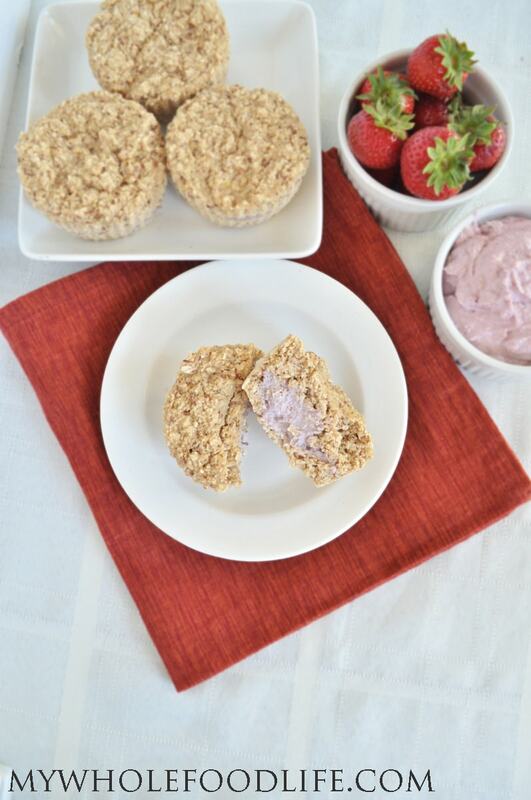 These strawberry oatmeal muffins are very easy to make. I used a strawberry cashew cream, but you can also use strawberry yogurt if you like. Not only are these muffins made healthier, they have a nice protein boost thanks to the filling. These might be a hit with pickier kids. My picky 4 1/2 year old loved them. Especially the filling. I hope you enjoy them as well. These healthy, cream filled muffins are vegan and gluten free. Oatmeal muffins with a surprise inside! Drain and rinse the cashews that have been soaking. Add them to a blender with the strawberries. Blend for a minute or two. You may need to add a little almond milk to help get a smoother consistency. Taste the cream. If it's not sweet enough to your liking, you can always add in a tablespoon or two of maple syrup. Mix all the dry ingredients in one bowl . Mix wet in another bowl . Add dry to wet and mix until combined. Place liners in your muffin pans . I use silicone liners that work great. Add a small amount of batter to the bottom of each muffin. Then add a dollop of the strawberry cream on top. Fill the remaining muffin cups with more batter until the cups are about 3/4 of the way full. Place the muffin pans in the oven. Let the muffins cool completely before carefully removing them from the pan. If you have an allergy to nuts, you can probably use Greek yogurt instead of cashews in the filling. These muffins should last at least a week in the fridge. You may also be able to freeze them. Enjoy! Hi Melissa! These look positively yummy!! Just a quick question about the strawberries - should it be a 1/2 cup whole strawberries or sliced? Thanks so much and can't wait to give this recipe a go! You are awesomeness personified! Thanks again! Wonder how these would be with just mixing berries in the batter?? Would I see any difference if I used Honey rather than maple syrup. Maple syrup affects my blood sugar and honey doesn't. I think honey will work just fine too. These look awesome, Melissa!! I don't have any oat flour, though. Have you ever tried to make your own or do you think another type of flour will work? Thanks!! Thanks! I make my own flour from rolled oats. It works great! I made these and they taste great! But, if you could include more details about the amount of batter to place in each tin, that would be very helpful. I ended up with 9 complete muffins + 3 that I didn't have enough batter to cover the strawberry cream. Also, tons of leftover filling - any suggestions for what to do with it? Thanks! There will be leftover filling. I just mixed it into yogurt, swirled it in oatmeal and spread it on pancakes. For the muffins. I just added a small amount into the bottom of each muffin cup. Just enough to cover the bottom. Then I put a large amount of cream on top of that. Lastly, I added more batter. I hope that helps? My muffins seem so wet after 14 min. Will they firm up? (Currently I've baked them to 16 min, but I'm worried about burning them! This happen with a number of the vegan recipes I try. (Including your strawberry banana muffins). The tooth pick also comes out wet after "over baking". Do I just need to have faith that they will be ok when they cool? Sorry you are having issues. :( You may need to just bake them longer. With the banana muffins, cooking time can vary because the size of bananas can vary.